If you live in or near Lawrenceville and are searching for a pediatric dentist you can trust to provide dental care for your children, we can help. We are Lawrenceville Family Dental Care, a comprehensive, family dental practice that serves both children and adults of all ages. Our practice offers a full range of preventative and general dental care specifically tailored to meet the needs of children. Our dentist and staff are highly focused on prevention and education and we work hard to help children develop positive oral hygiene habits that will provide them with a lifetime of good oral health. Both the American Academy of Pediatric Dentistry and The American Academy of Pediatrics recommend that all children should see a dentist before age one. Your child's first dental appointment is an important step in a lifetime of dental care. During this first visit, Dr. Ashish Patel our dedicated dental support team members will take the time to get to build a rapport with your child and closely examine the development of his or her teeth. We also take this important opportunity to educate both the parent and the child regarding good dental hygiene habits to be practiced at home. For outstanding pediatric dental care in Lawrenceville, GA, trust the professionals at Lawrenceville Family Dental Care. We love your kids and we offer a full range of pediatric dental services including dental cleanings and checkups, dental x-rays, sealants, fluoride treatments, treatment for early childhood caries and more. Our family dental practice is specially staffed and equipped to handle pediatric patients and our dentist and staff are committed to making your child's visits to our dental office as comfortable and as enjoyable as possible. 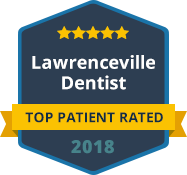 If you want the best in pediatric dentistry that Lawrenceville has to offer, call Lawrenceville Family Dental Care. Our practice is currently accepting new patients and we accept most forms of dental insurance. We also welcome patients without dental insurance and offer an affordable preventative care package for our valued patients with no insurance. Please contact Lawrenceville Family Dental Care today to schedule an appointment for your child or children. We thank you for allowing us to take care of your dental needs and we look forward to exceeding your expectations.